Oh golly, I didn't take French in school... I can't pronounce this designer's company name... but I LOVE their designs! 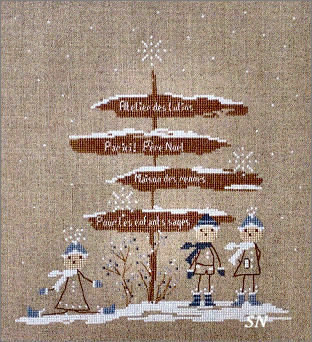 Over the years, we have had this little tree in the shop, and while I was in France last year... 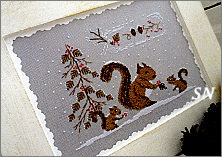 I personally bought that little squirrel pattern in a local needlework shop. So... I asked our distributor to find her... and look what we now have!!! 10 beautiful charming charts by Jennifer Lentini... I still can't read them, but they are coded in the *UNIVERSAL STITCHING LANGUAGE OF DMC!!! * (Life is good!) Choose any fabrics you like - you'll be able to tell color from the chart covers... maybe add some beads or fuzzy threads from your stash... you decide! I just LOVE them all!!! Each is presented in chart format, super-clear charting with red markings on the charts for any backstitches or stitch detailing. Click the pics to see the rest! 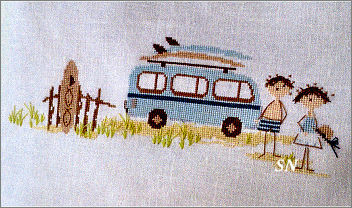 To The Beach #1811 - 168 x 60 - What a darling surfer-van, and the little stick people are just the coolest! This one has a second, companion design in here... they are holding their boards! Squirrels #1601 - 161 x 105 - A mom and her babies! They're taking berries off the bushes. Can you see the smaller part in the top right corner? 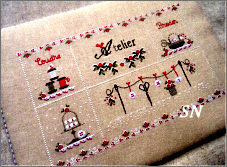 It's only 30 x 70 - so it'd make a pretty pin cushion or a pair of little ornaments!!! 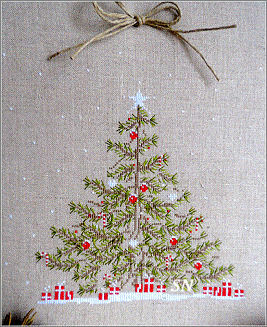 Christmas Workshop #1416 - This is a little needlework sampler! 5 Sections, the whole thing is 213 x 131... but each of the smaller sections can be stitched by itself. There is a stack of thread spools, a beautiful stitching basket, and a darling little clothesline of hanging scissors and buttons! See? I told you these were enchanting!!! Three more darling designs -� Fall, Winter and Christmas! NOEL #1816 - This measures 219 x 79 in size, she shows the girl in the circle stitched in blues on the back side of the chart. 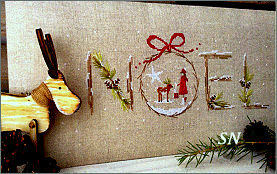 So classic, NOEL is spelled out in greenery and sticks! 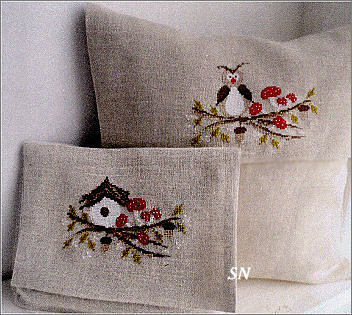 Little Owl & Mushrooms #1611 - Measuring 89 x 58 each - you get both designs in here. 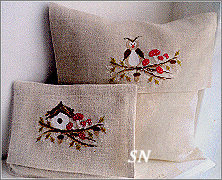 Tiny greenery branches with acorns on them... and either a resident owl or his charming abode! Sleigh #1616 - Little gnom-y people playing in the snow! So simple, but so cute! The tree is just two twigs of two colors, but it's a beautiful tree! 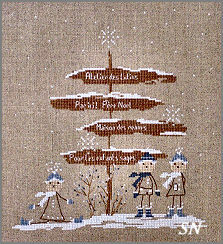 There are two other design variations stitched on the back of the chart, as well. 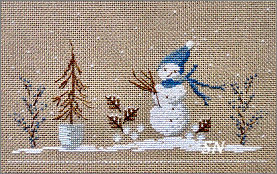 Measures 287 x 142 in stitch count. 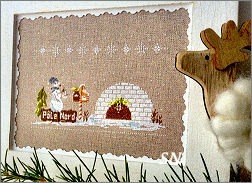 My Igloo #1817 - How cute is this? The little snowman has decorated his Igloo for the Holidays! His mailbox has a candy cane pole! Measures 144 x 91. 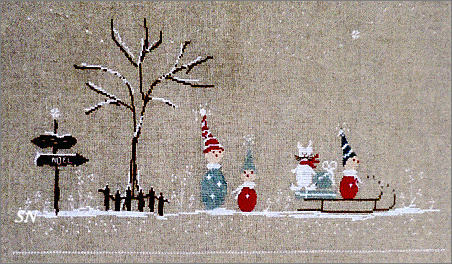 Winter Stick People #1720 - I had to make up that title! This is a cool pic of three stick people - I think they're darling! The 4 signs above them say something... I just don't know what! You just stitch this however you want to! 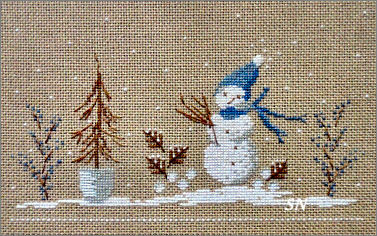 Measures 128 x 137 in stitch count. Winter Snowman #1615 - Just a peaceful little guy on soft blues, white and dusty brown... maybe you can find a bunny chart to add to this? I think he might be lonely!